NEBA 5.0.5 focuses on improvements on the NEBA tooling for resource model statistics and viewing logfiles. It also contains a bug fix for a potential, albeit unlikely race condition if multiple model registries services are started concurrently at exactly the same point in time. The model statistics view now has improved smart formatting of the statistical data. Larger amounts (e.g. number of instantiations) are now formatted in 1000's (k) or millions (m) and millisecond data is formatted as milliseconds (ms), seconds (s), hours, days or years to better fit scenarios with large volumes of data. The log viewer now shows a continuously updated view of the actual time on the server and the server time's UTC offset to support log analysis spanning different time zones. With 5.0.5, the log viewer now has a limited scrollback buffer when tailing log files. The number of lines correspond to the chosen amount of tail data (0.1 MB by default). This allows following logfiles with a lot of changes over a longer period of time without increasing the browser memory usage. The log viewer has also been enhanced with client-side grep support. The grep term is a regular expression applied to the client's view on the log data. This allows flexible filtering of the data viewed and works for both live followed data and tailed data. The grep mechanism respects the semantics of ERROR stack traces in the logfile. 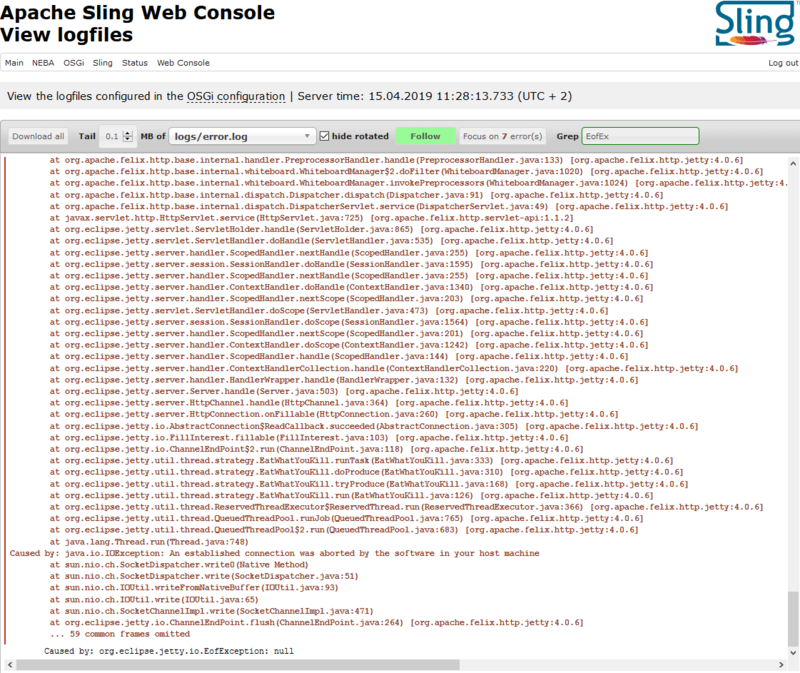 That is, if a grep expression matches part of a stacktrace, the entire stack trace is shown and not just the matching line. Finally, the optional NEBA Spring integration has been updated to Spring Version 5.1.5, containing minor updates and improvements. Users of 5.0.4 can upgrade to 5.0.5 without code changes. NEBA 5.0.5 features improvements to the log viewer and model statistics and includes a minor Spring upgrade. NEBA 4.3.4 Ships with numerous improvements backported from 5.x and the current Spring 4.x. GA version. NEBA 5.0.4 Ships with support for the composum console, primary node types in the model registry and improved bundle state handling. NEBA 4.3.3 Ships with Spring 4.3.19 and support for HTTP PATCH requests. NEBA 5.0.1 Updates to Spring 5.0.8, improves usage of the @Filter annotation and fixes a problem with fasterxml. NEBA 5.0.0 introduces a flyweight kernel, an optional Spring 5 integration and ships with a vast number of improvements. NEBA 4.3.2 Ships with Spring 4.3.10 as well as enhancements and a bugfix for the NEBA log viewer.